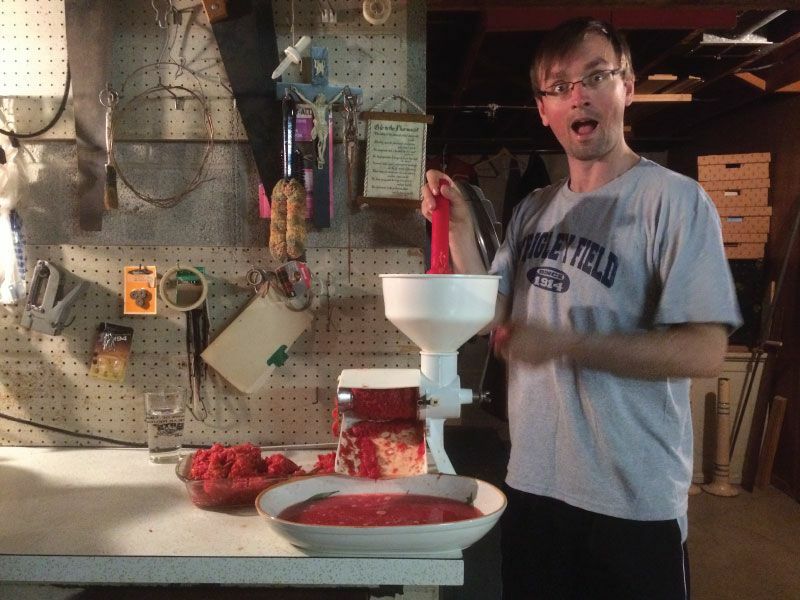 For me, the tomato will always be inextricably linked to my family’s annual tomato canning tradition. 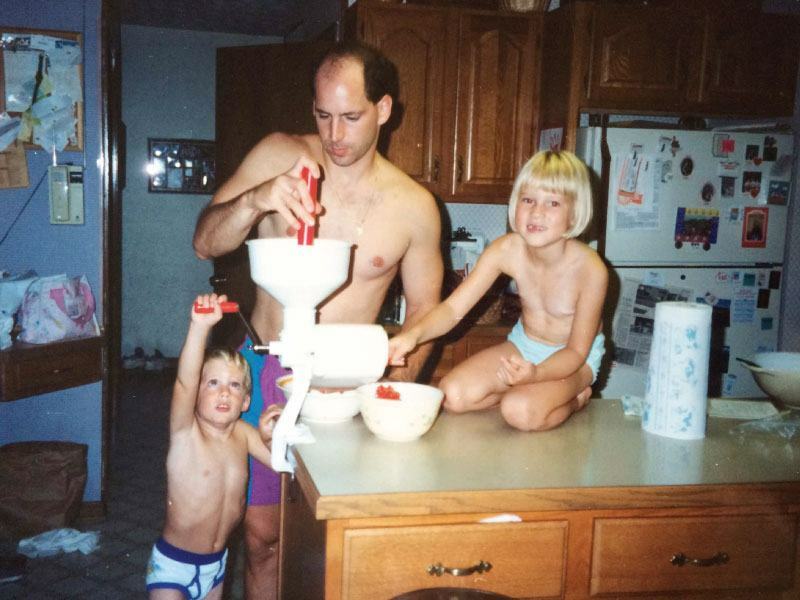 Every year around Labor Day, we’d gather around bushels of plum tomatoes and get to work. It’s a long process—one that’s best done in the company of others. In this case, many hands make (lighter, but not exactly) light work. Tomatoes are also one of my most potent examples of the connection between memory and sense of smell. 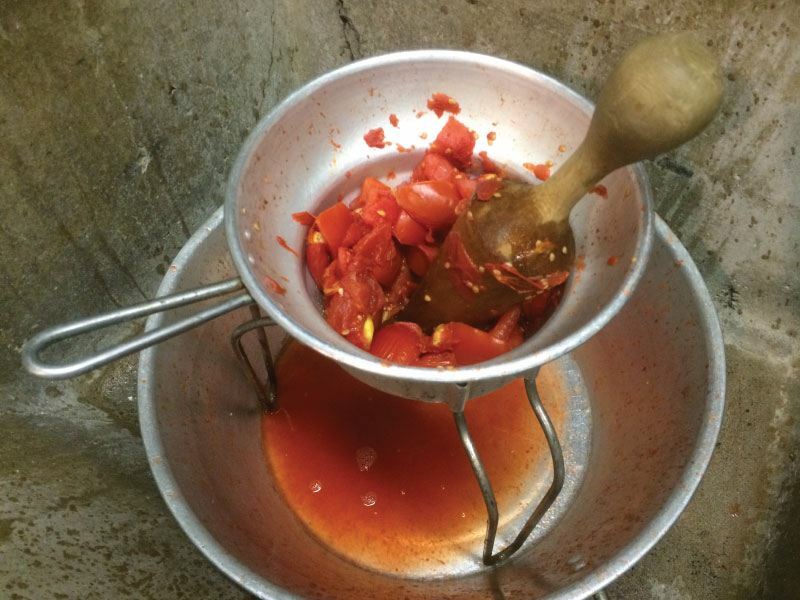 I swear, the aroma from the huge stockpots of simmering tomato puree on that one Sunday in September seeps into the walls of my grandma’s basement and kitchen, and continually releases that sweet, acidic scent throughout the year. More than that—what stops me in my tracks every time is the smell of tomato vines. To me, that’s the pure essence of tomato season. At the risk of sounding quite strange, I’ll share with you that every time I encounter a tomato plant—whether it’s a start ready to be planted or a vine spilling out over a neighbor’s fence—I rub the leaves between my fingers and smudge the scent under my nose where it lingers for awhile. It’s like my own essential oil. These memories are so fresh, so palpable, so transporting. And I’m not just waxing poetic with no backup. Edible memory is a real, researched-and-written-about thing. It’s strong. It pulls us back to center. It connects us with times and places and people past. Speaking of memory, do you remember where the tomato originated? I didn’t until I snagged a copy of 100 Great Pasta Dishes by Ann and Franco Taruschio for some light bedtime reading. Hint: it’s not Italy. Maybe it’s because of my ancestry, but I always thought it was. In reality, just like the potato, it’s from the Andes in South America. What to plant. With all the buzz around heirloom tomatoes, it can be easy to get caught up in paralysis by analysis when choosing what to plant. Remember that this isn’t a make-or-break decision, and pick a few types that intrigue you. If you live in a particularly hot climate, be sure to grow heat-tolerant varieties. There are two types of tomato plants: determinate and indeterminate. 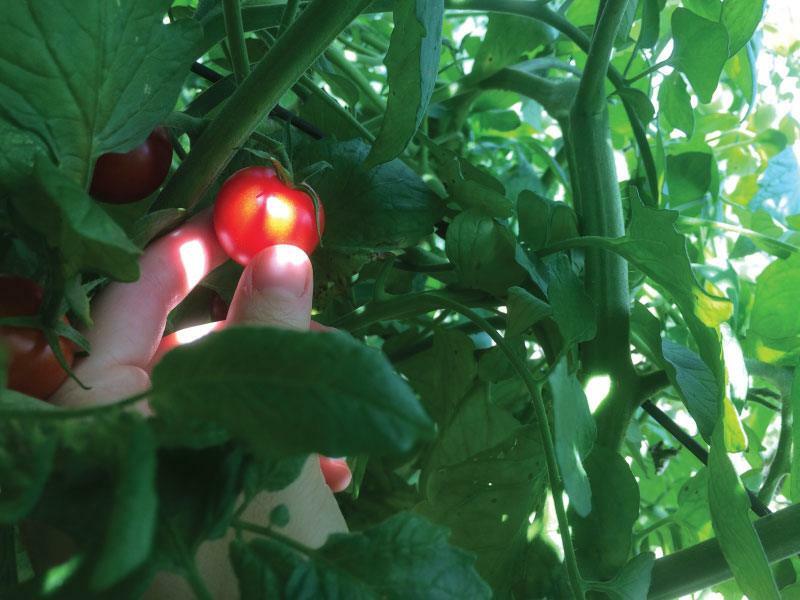 Determinate plants stay smaller and their fruit all ripens at about the same time – a small tomato cage is all they need, if anything. Indeterminate plants keep growing and growing and growing (which is why they’re usually staked or trellised more sturdily) and ripening over time. When to plant. If you start your tomatoes from seed, sow them inside 6-8 weeks before the last spring frost date. Set them under a plant light for about 14 hours a day. Transfer each plant to its own 4-inch pot after it grows its first true leaves. Plant those starts outside after the last spring frost date once the soil is warm. Where to plant. Plant in as much sun as you can. If you live in a hot climate, a spot with a bit of light afternoon shade may help protect your plants, but for the most part, if they have enough water, they like full sun. How to plant. Incorporating some compost is a good idea. Tomatoes are interesting in that it’s helpful to bury the stem up to the lowest leaves to encourage root development and a strong plant. Some people do this sideways so the step is closer to horizontal. Space plants about two feet apart. For indeterminate tomatoes especially, add a stake, trellis, or cage for support immediately after planting. Water generously for the first few days. How to maintain. Water regularly, about 1 inch per week. Consistently moist soil prevents cracked skins and blossom-end rot. Add mulch a few weeks post-planting after the soil has had a chance to heat up. Some people pinch off suckers that show up in the nooks where two branches meet so energy gets diverted to the fruit. Likewise, about a month before frost, you can cut the top off of all growing stems for the same reason. Some people just let those suckers and stems do their thing and are happy to save their own effort in exchange for a smaller harvest. How to harvest. Learn what color your particular tomato variety turns when ripe. When it reaches that color and is still firm to a gentle squeeze, it’s ready. The tomato should come easily off the vine into your hand with a gentle twist. If the first fall frost threatens while you still have many unripe green tomatoes on the vine, they can be harvested and pickled or pan-fried. How to store. I personally like to store my tomatoes at room temperature. (Many will argue that the fridge doesn’t damage a tomato’s flavor or texture, but I don’t take my chances.) Lay them out in one layer and eat them within a week. You can preserve them by freezing, drying, or canning. For as much as I can drone on and on about the importance of food traditions, I do not have a perfect record of upholding them. In fact, the way I felt after letting a tradition slip by unhonored is what drives me to make the plea. 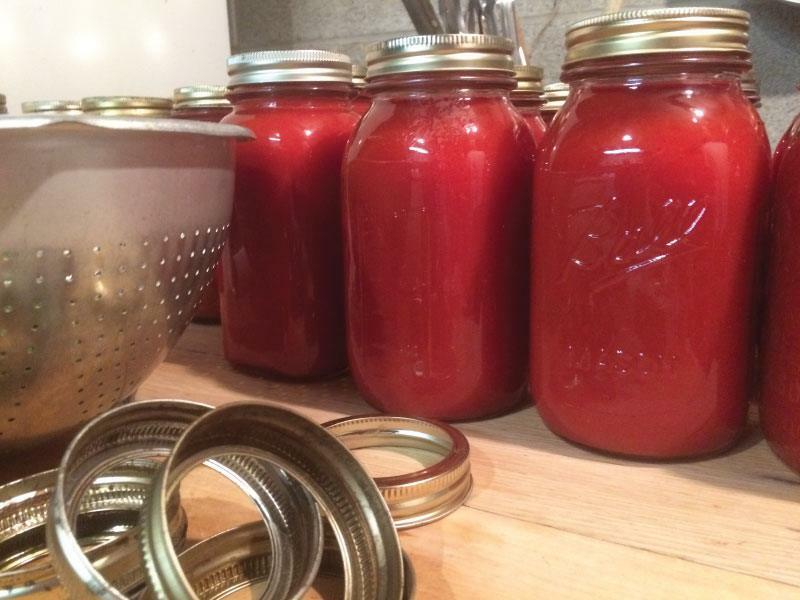 Last year at this time I snapped to the realization that tomato season was almost over, and I hadn’t yet sauced and jarred them. More importantly, I hadn’t organized any friends to come over and help, nor had I reserved the very crucial, time-saving food mill from the kitchen tool library. 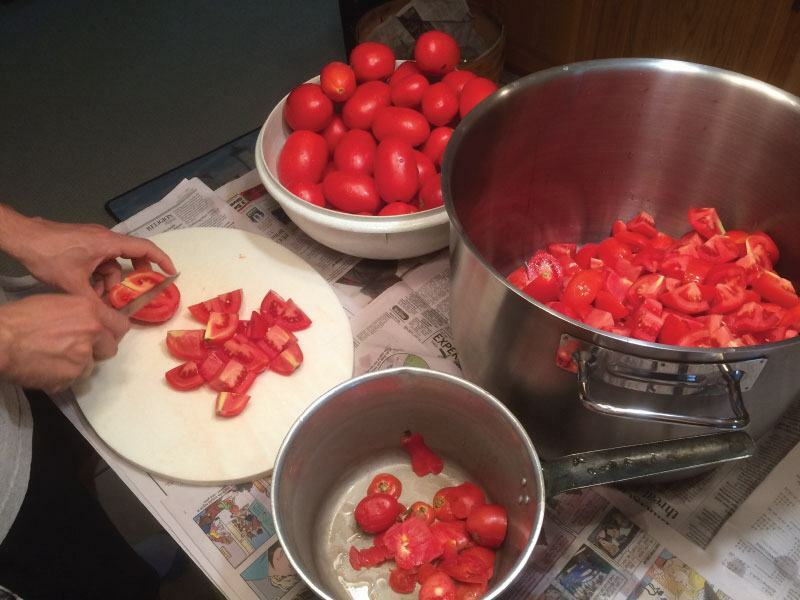 My housemates, including my husband, were gone for the weekend, but I pressed on, by my lonesome, to cut, simmer, sieve, boil, and jar 40 pounds of tomatoes. A few pounds in and I was already sweating. I tried to move quickly and to remember all that needed remembering, but before I knew it, I burned one large pot full of precious, hard-won puree. I almost quit out of sorrow and exhaustion on the spot. When I was still freshly removed from Ohio and newly planted in Portland, I made this soup and shared it with friends on Easter Sunday. It was lovely—I remember being so glad I’d carved out the time to do it. A year passed, and, as if my edible memory had been replaced with edible amnesia, I declared myself “too busy” to make the soup due to a series of events that no longer matter. Easter came, and it went, unmarked by the ceremonious slurping of worm soup. It seemed ok. I was ok. Wasn’t I? But the following week, I felt a bit ‘off,’ as if a part of me had been left unfilled. I was a little less whole and a little less rich. In that sadness, I swore that next year—no matter what—I would be making that soup. And I did. And I felt so happy and so whole. But can you guess what happened the next year? Yep, I just simply did not have the time. It was “no big deal.” I had “a lot on my plate.” So again, Easter came and went, with no appearance from the soup. Again, I felt the sadness. This time, a little anger was thrown in the mix, because I should have learned my lesson already. These traditions are immensely important to your wellbeing. They’re essential, really. More essential than (most) anything else you’re putting above them. Make the time. You’ll be glad you did. Do you think this forgetting happens on a cultural level? I think so. I believe that each time a tradition goes unhonored, some piece of our culture dies with it. I believe we carry with us a quiet burden of sadness about this, but we don’t know it. 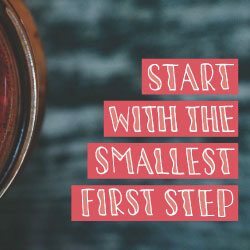 All the individual pains from each small forgotten tradition may not be immediately felt, but in the end, I imagine we’ll feel a lot like I did that first Easter I skipped out on worm soup: sort of ok, but less whole—less rich. For the first time in a long while, I found myself in Ohio with my family this August. 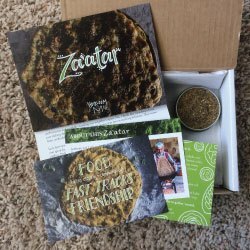 I hadn’t participated in the annual canning with them in years, and we realized that we just might have the chance to do it together. We began seeking out bushels of plum tomatoes—three weeks earlier than normal—to see if there was any chance we’d find them. All of us took turns to call farm stands and produce markets. We received a lot of no’s, and it looked like we wouldn’t be able to pull it off. But, after some scrambling, a mere three days before canning Sunday my stepmom came up victorious. She found a market that had plenty of Romas for us. All the photos in this story are from this year’s canning day (well, except for one throwback shot…see if you can spot it). My husband Bjarke joined us for the first time, and my heart expanded through sharing it with him. 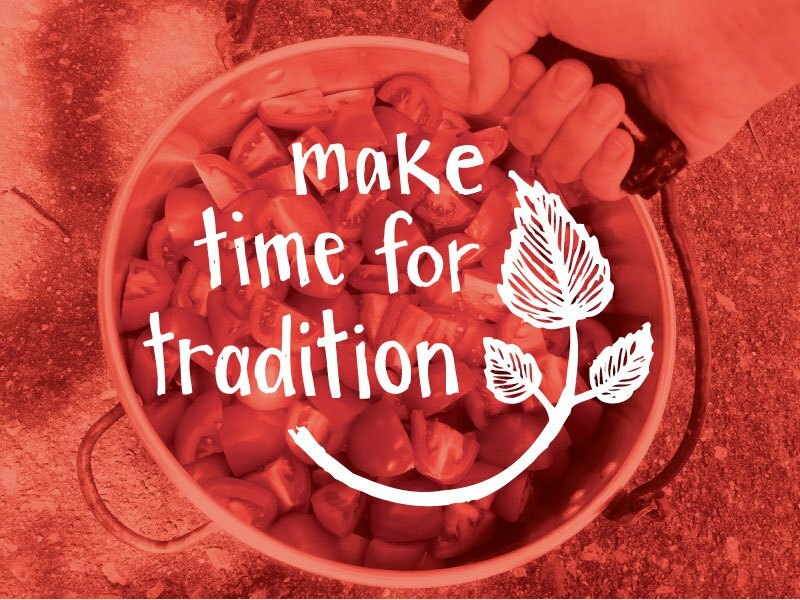 Practice this in your own kitchen: uphold an old tradition or start a new one. check in with yourself before you forego a culinary tradition in the future. Is the alternative really that important? How can you make the time? I don’t want to paint an overly rosy picture; canning tomatoes doesn’t solve all of my problems, or my family’s, or the world’s. But each time it happens, I feel lifted by a subtle joy. I am nourished. I am whole. It’s part of the American Heirloom Project I’m developing to help us build a food culture we’re proud to pass down.